Ada is proud to offer the ultimate personalization in bespoke high jewelry— priceless diamonds grown from your meaningful materials. The possibilities are endless and the diamonds are everlasting. Ada can process and purify any carbon-containing items, such as a bridal bouquet or graduation keepsakes, to high-purity carbon that is utilized to grow priceless diamonds that brilliantly celebrate your finest moments and memories. We call these cultured diamonds Lavoisier Diamonds in honor of Antoine-Laurent de Lavoisier, the father of modern chemistry. Among his many 18th-century scientific achievements, he proved that diamonds were made of carbon. Commissioned Diamonds (L-R from top): Meaningful donor material is loaded into the graphite crucible and sent to Ada Diamonds. Over the course of several weeks, the diamond crystal grows in the diamond press. Once the diamond has reached the desired size, it is cut and polished and ready to be set in fine jewelry. You are personally involved in the growth of your Lavoisier Diamonds. A member of Ada's Diamond Concierge Team will promptly respond to your inquiry to discuss your desired diamond(s) and review the materials you plan to use to ensure suitability for diamond growth. Ada will then ship you a small graphite container, called a crucible, that you fill with your meaningful materials such as flowers, photos, documents, fabric, wood, wine corks, and yes, even hair from yourself and/or of a loved one. Return the crucible to Ada in the supplied packaging, and we will process and purify the material into 99.99% pure carbon. Your carbon will then be inserted into a high-pressure, high-temperature diamond press and Ada will cultivate your Lavoisier Diamond(s). Both colorless and fancy-colored diamonds can be grown in sizes in excess of 10 carats, and will be cut and polished to the shape of your choosing. Lead times for most Lavoisier Diamonds typically range from 12-20 weeks, depending on the complexity and quantity of diamonds commissioned. All Lavoisier Diamonds will be colorless (D, E, or F color grade), Very Slightly Included or better (IF, VVS1, VVS2, VS1, or VS2), and Excellent or Ideal cut. Carat weight of diamonds delivered may be 10-20% larger than the purchase price at no additional cost. For example, if you purchase a 1 carat Lavoisier Diamond, you could receive a 1.06ct or a 1.13ct diamond. Pricing is inclusive of graphitization, diamond growth, cutting, polishing, grading, photography, videography, and shipping. 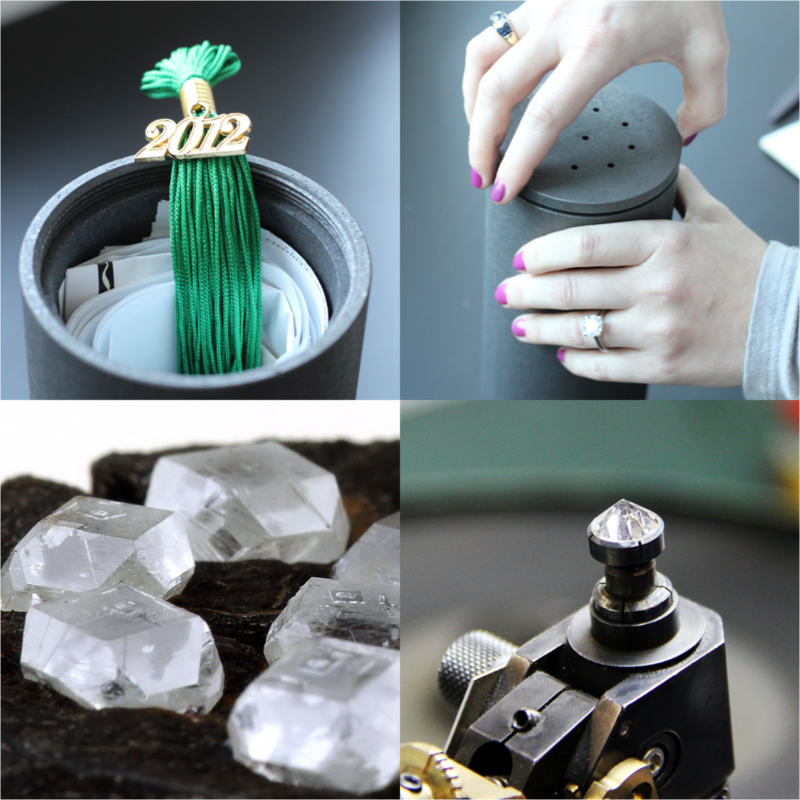 It will also include a glass vial of the graphite created from your material as well as the pieces of your rough diamond that are removed during the process to cut and polish your diamond gemstone. Pricing does not include setting/jewelry, which is available at a nominal rate. For matched pairs and purchases of multiple diamonds, the diamonds will be cut to precise dimensions for matched earrings, eternity bands, tennis bracelets, etc. 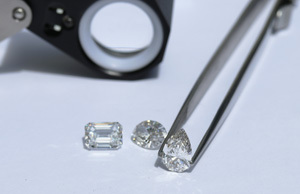 Diamonds can also be cut to your preferred cutting style, dimensions, or carat weight. Lavoisier Diamond pricing is significantly higher than Ada's pricing for non-commissioned diamonds, as it is a difficult and time intensive process to process and purify the donor material, adjust the growth process to account for the subtle differences in the donor material, and to need to grow larger rough diamonds to ensure that the diamond grown is suitable to be cut and polished into the purchased size. Here are details on pricing for Ada's non-commissioned diamonds. Every piece of Lavoisier jewelry is custom made to order by one of the best jewelry fabricators in the United States to the most exacting of standards. Lavoisier Diamonds are priceless diamonds; the quality of the Lavoisier Jewelry will appropriately match. Any piece of jewelry offered by Ada Diamonds can be fabricated with Lavoisier Diamonds, or we can make any piece of jewelry that you can imagine. Our Lavoisier Diamonds are our flagship offering, and we pride ourselves on delivering the highest quality jewelry in the world to our Lavoisier Clients. If you are interested in exploring a custom design, please inquire and a member of our Diamond Concierge Team will promptly reach out to answer any questions you may have and discuss next steps. Ada will ship you a specialize high temperature container, called a crucible, and a vial for liquids. Simply pack the crucible with your meaningful materials such as documents, photos, fabric, wood, flowers, Champagne, wedding cake, other momentos. You will then return the crucible to your Ada Diamonds Concierge in the same packaging with a provided shipping label. Ada Diamonds will inspect all of your donor materials to ensure there are no materials, such as metal, that will damage the graphitizing equipment. If need be, Ada will preprocess some of your donor material (most commonly boiling liquid down to extract the water from the liquid). Narcotics, Contraband, or any material prohibited by US or California laws. Ada Diamonds will place the crucible in a 3,000°C furnace for approximately four weeks. At this temperature, virtually all of the non-carbon portion of the donor material will boil into gas and evaporate out of the crucible. The donor carbon is then placed in another specialized high temperature vacuum furnace for another four weeks where halogen gases (such as fluorine, chlorine, and bromine) are introduced into the furnace to remove the remaining non-carbon impurities. The donor carbon is then carefully blended with other ultra-pure synthetic graphite and packed into a growth cell. At the bottom of the growth cell is a very small diamond seed. The growth cell is loaded into a massive pressure cooker and the diamonds are grown on the diamond seed, atom by atom. This growth process is called High Pressure, High Temperature (HPHT) diamond growth. If you are interested in fancy colored diamonds, Ada can intentionally add trace elements to the growth cell, such as nitrogen or boron. The diamonds are carefully cultured by recreating the extreme pressure and temperature required to convert carbon into a diamond crystal structure. The growth cell is pressurized to over one million PSI and heated to 1,500°C. At this extreme pressure and temperature, the graphite melts into liquid carbon. The bottom of the growth cell is then cooled slightly, and the liquid carbon slowly transitions back to solid. At the extreme pressure of the diamond presses, the solid form of the carbon is diamond. It takes approximately one week to grow a diamond that is cut and polished into a one carat diamond gemstone. Once the growth cycle is finished, the diamond will be laser scanned by sophisticated software to determine the best shape and size that can be cut from the rough crystal. If the crystal is not suitable to cut a superlative quality gemstone, it will be discarded and additional growth cycles will be undertaken until a suitable diamond is grown. In some cases it takes up to 5 growth cycles to get the rough diamond we need for your gemstone. In some cases, you will be given the option to choose from several options of carat weight and clarity that can be cut from the rough diamond crystal. Finally, your Lavoisier Diamonds are ready to be cut and polished. The initial cutting is done with a robotic laser, and the final polishing will be done by a master gemcutter with decades of experience working with superlative diamonds. Your diamond will then be shipped to GIA or IGI for grading. All Lavoisier Diamonds laser etched with a certificate number to guarantee authenticity and can also be etched with a personalized message up to 30 characters. (optional) Your Lavoisier Diamond will then be set into your bespoke creation by hand in the United States. Cultivated diamonds have been set in bespoke jewelry, exquisite car interiors, and even home decor. The possibilities are endless. After your Lavoisier diamond has been graded as a loose stone or set into your bespoke jewelry creation, your Ada Diamond Concierge will provide a final inspection before taking a high resolution video and shipping your finished Lavoisier diamond creation to you per your specifications.